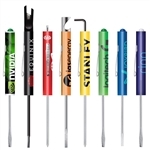 Our custom printed promotional screwdrivers are available with a standard blade, phillips blade, reversible blade, or specailty blade and the Zippy Brand screwdrivers. All are available blank or with your custom imprint on the handle. These small screwdrivers are the perfect promotional screwdriver for your trade show, event, or new product launch. Pocket Partner Standard Blade Pocket Screwdriver with pocket clip. 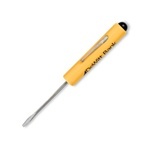 Reversible Standard Blade / #0 Phillips Blade Pocket Screwdriver with pocket clip and button top. Standard or Phillips Blade Household Quality Screwdriver Made in the USA.